Being the naive air traveller that I am, I decided to wear my 2006 ‘Under Pressure’ t-shirt purely for comfort. Forgetting that it depicted someone being handcuffed by police, I had to answer some questions about it as I passed through security at the Ottawa airport. The flight from Ottawa to Halifax was uneventful. I sat next to a jittery young lady who kept to herself. As I started in line for the flight to Deer Lake, I ran into the man I’ve seen more than anyone else over my years of music festivals - Bob Breen. He’s the face of OIART (Ontario Institute of Audio Recording Technology) and tends to hand out the ECMA award for engineer of the year on annual basis. My brother, Colin, attended OIART and that’s how I first met Bob. Then I saw an old classmate, Meghan Scott. We graduated together, and she’s now managing Newfoundland’s Chris Kirby and my long lost blues brother Ross Neilsen. By day, she works at The Playhouse in Fredericton and filled me in on how construction of the E-Plex has shut down the Rogue. Even better - construction is 3 meters from her office window. 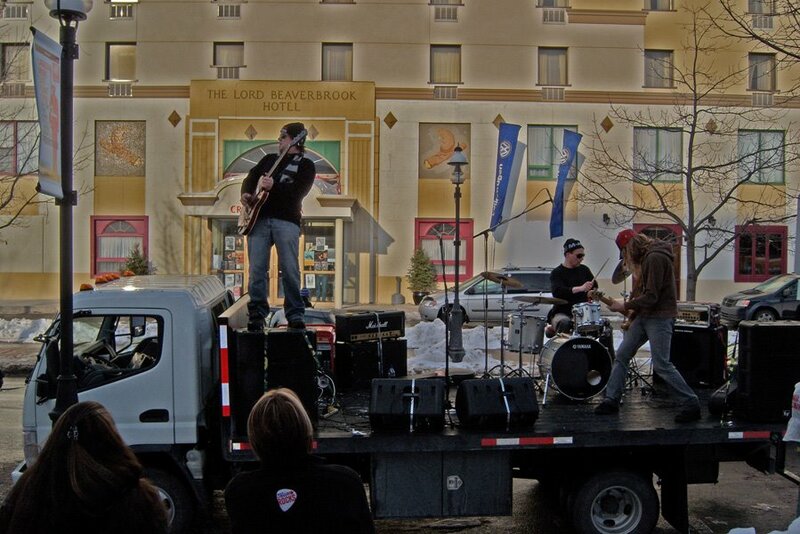 Unfortunately Ross won’t be making it this year to follow up on his 2008 ECMA shenanigans (a la Gordie Johnson at SXSW) - see picture below. This year was just "too much of a hassle" said Meghan. On the flight, I sat next to a friendly Newfoundlander from Smiths Harbour. He was one of about a dozen truck drivers who work for Sun Corp in Fort McMurray and fly back and forth every 18 days. He pointed out 2 of his co-workers a few rows away, who are Uncle and cousin of the Canadian Idol finalist Rex Goudie. After picking up my luggage, I was approached by a man asking me if I needed a drive. I said ‘yes’ and followed him to a van. I couldn’t see any signage on the van to indicate it was a taxi. I was a bit nervous, but this is Newfoundland after all. It turned out to be a taxi after all, and he gave me his cell number to call him for pick up the next day. By 1 am, I’d arrived safe and sound at Birchview Bed & Breakfast in Deer Lake. I was informed bacon & eggs were served at 8 am and checkout was 10 am. It’d be an early start to my ECMA weekend.